North Miami Officer Was Aiming At Man With Autism, Union Chief Says : The Two-Way "This is not a case of a rogue cop; this is not a case of police abuse," the head of the Dade County police union says, adding that the officer who shot Charles Kinsey is praying for his recovery. 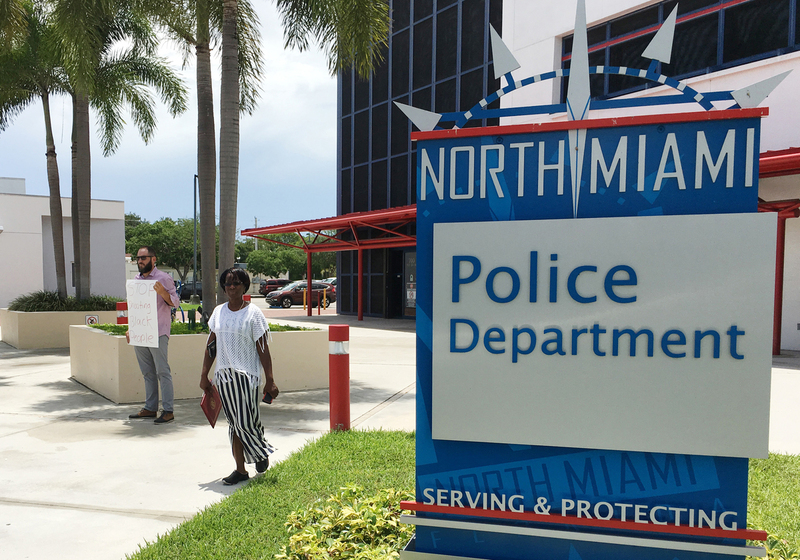 Gabriel Pendas (left) protests outside the North Miami Police Department on Thursday. The department held a news conference about the police shooting of a black behavioral therapist helping a man with autism. Days after Charles Kinsey was shot by North Miami police as the behavioral health care worker tried to help a patient, we now know more about the officer who fired the shot — and according to the head of the local police union, the officer was trying to shoot Kinsey's patient, a man with autism, not Kinsey. "Fearing for Mr. Kinsey's life, the officer discharged his firearm, trying to save Mr. Kinsey's life," says John Rivera, president of the Dade County Police Benevolent Association. "And he missed, and accidentally struck Mr. Kinsey." Rivera also declared that the case is different from other recent incidents of police shootings of black men, stating, "Folks, this is not what the rest of the nation is going through." He added, "This is not a case of a rogue cop; this is not a case of police abuse." The officer was one of several who responded to a call to the North Miami Police Department about an armed man who was threatening suicide, as Rivera said in a news conference that was covered by The Miami Herald. He said the officers saw Kinsey, who is black, in the middle of the street with a white male — later identified as a man who had wandered away from an assisted living facility group home (and whose ethnicity we haven't separately learned). On Friday, The Herald reported that the North Miami Police Department had identified the officer as Officer Jonathan Aledda. Previously, the police had only given a general description of the officer, saying last night that he was a 30-year-old Hispanic man who has been on the police force for four years. "It appeared to the officers that the white male was trying to do harm to Mr. Kinsey," Rivera said, citing the man's motions toward Kinsey just before the officer opened fire. Rivera said he was speaking about the case "to fix some wrongs" in the discussion it has generated, describing it as a tragic accident brought on by officers' uncertainty over the patient's intentions. He did not dispute Kinsey's account, in which Kinsey has said he had his hands up when he was shot. "Listen, Mr. Kinsey did everything right," Rivera said. "Let's be clear about that. Mr. Kinsey did everything right." Reading a brief statement from the officer who shot Kinsey, Rivera said, "I took this job to save lives and help people. I did what I had to do in a split second to accomplish that, and I hate to hear others paint me as something I am not." While acknowledging that all the facts of the case are not yet known, the police union chief also urged politicians not to use "gamesmanship" in discussing the case. As we reported yesterday, Kinsey says he was lying on the ground with his hands up before he was shot — an account that's backed by the video that captured the moments prior to the shooting. The shooting came during a tense situation, parts of which were captured on video, and published online this week. Kinsey later spoke to local TV news Channel 7 WSVN from his hospital bed to describe both his fears for his patient — who was apparently playing with a toy truck in the street — and his surprise at being shot. Kinsey told Channel 7: "I just got shot! And I'm saying, 'Sir, why did you shoot me?' and his words to me, he said, 'I don't know.' "
The health care worker also said he was surprised by what happened after he was shot, saying he was handcuffed and left bleeding on the ground while he waited for an ambulance. Kinsey left the hospital Thursday night, Channel 7 reports. "The officer in this case ... wishes nothing but the best for Mr. Kinsey," Rivera said, adding that the officer "is praying for his speedy recovery." An investigation into the shooting of Kinsey is ongoing; it now involves both the local state attorney's office and the Florida Department of Law Enforcement.